Posts about museums and exhibitions in museums. As recent posts suggest, I spent the last month working in Central Europe. 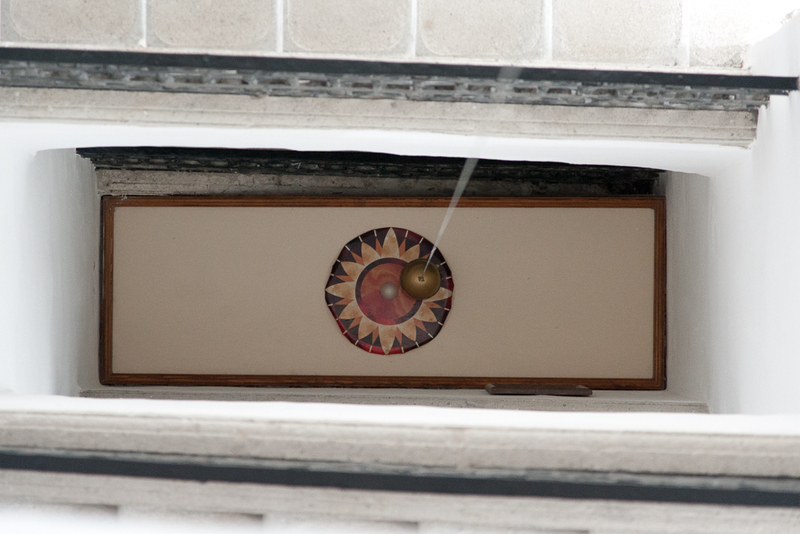 Here are a couple photos of sundials that can be found on many of the buildings in Austria. At the monastery in Klosterneuburg there is, apparently, a pole-style sundial dating from the mid-fifteenth century. Another sundial from the late sixteenth century adorns the side of a building. 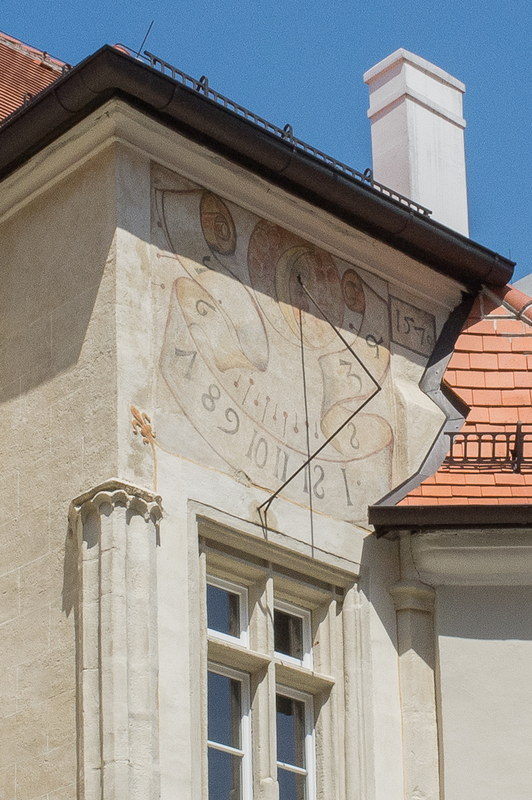 The newer of the sundials at Klosterneuburg dates from the 1570s. There are sundials all over Vienna. Tourists typically miss the one at the end of Stephans Dom in the center of the city because it is on the back of the cathedral avoided by most people. 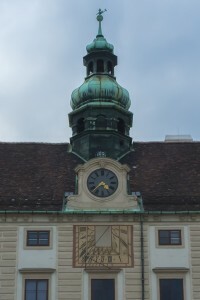 By contrast, many people do see the sundial and clock on the Hofburg, on the Amalienburg wing. The orb above the clock indicates the phases of the moon. Tour guides in Vienna typically attribute this sundial to Tycho Brahe (I have not bothered to confirm or disconfirm that claim—I merely report it). According to tour guides, Tycho Brahe designed this sundial on the Hofburg in Vienna. The northern Hungarian town of Eger is famous amongst Hungarians as the place where István Dobó defeated the invading Ottoman forces in 1552. 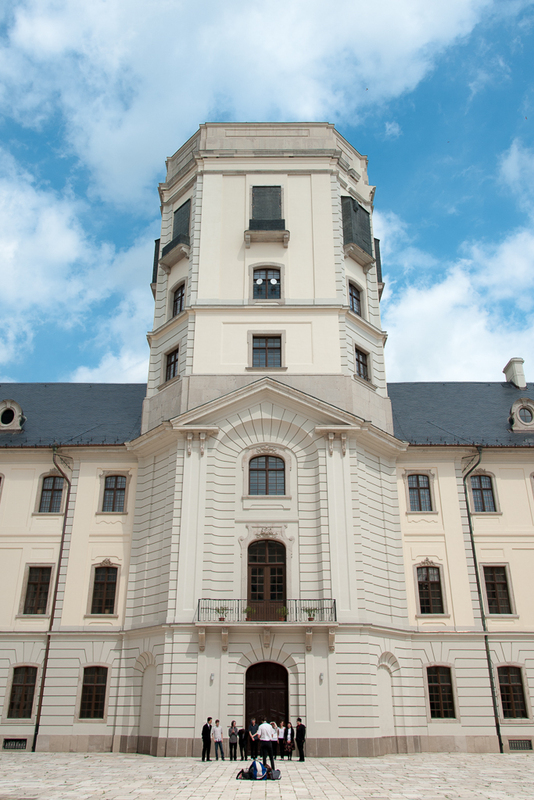 For historians of science, Eger is interesting for its Esterhazy Károly College. Originally Bishop Eszterhazy had hoped to establish a university in Eger, but he was unable to secure approval from the emperor. So, instead, in the 1760s he founded instead a teachers’ college, which continues to train teachers today. Inside there is a wonderful Baroque library with a rich collection of early modern books and a few manuscripts. The Astronomical Tower at the college houses a small astronomy museum. 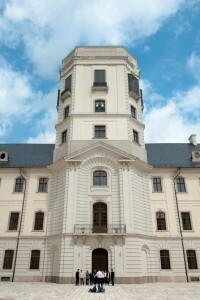 The tower at the Eszterhazy Károly College houses a small astronomy museum. The astronomy museum includes a number of old telescopes and a handful of naked-eye instruments. 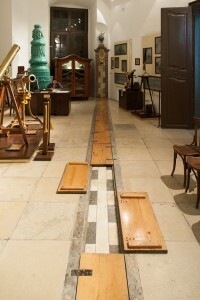 The room is divided by a meridian line, which was, apparently, designed and constructed by the astronomer Maximilian Hell. 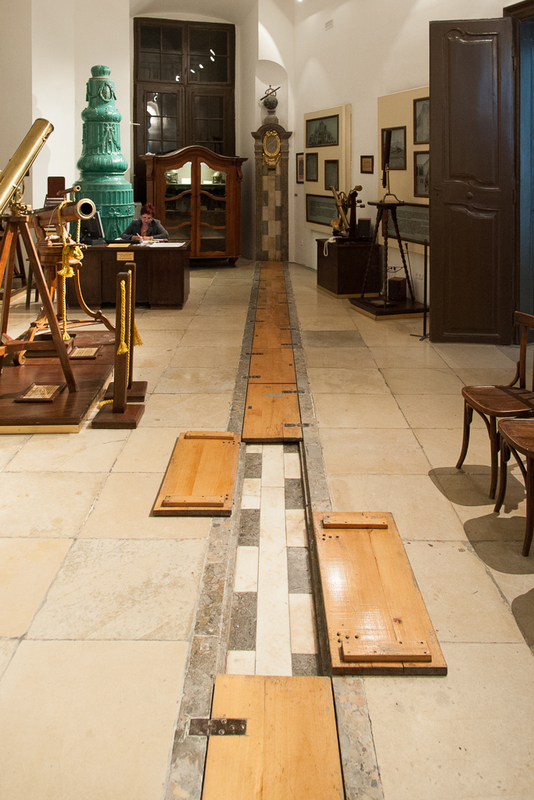 In addition to designing this room and the meridian line, Hell was the first director of the Vienna Observatory (for a recent study, see Nora Pärr’s Maximilian Hell und sein wissenschaftliches Umfeld im Wien des 18. Jahrhunderts . Pärr’s dissertation is available from the Universität Wien or as a book). The meridian line inside the astronomy museum. The tower is capped by a camera obscura, also designed by Hell in 1776. While there are a number of camera obscuras in various stages of decay across Europe, Eger likes to claim its is one of the oldest functioning instrument. If you climb to the top of the tower, you get a chance to see it in operation. The instrument has nearly a 360° view of the town, except where part of the tower’s roof obstructs the view. While the images are sharp and clear, the description offered by the person operating the camera is a bit fuzzy on details and needs to be taken with a grain of salt. 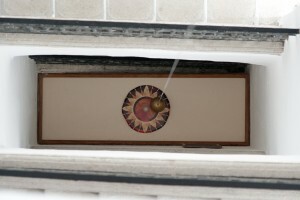 A Foucault’s pendulum hangs in the tower. The Astronomy Tower, its observation room with Hell’s meridian line, and its camera obscura suggest the importance of observatories as markers of scientific knowledge. It was also a way to connect Eger to Vienna, the cultural, intellectual, and administrative capital of the Austro-Hungarian Empire. Plague columns, or Marian and Holy Trinity columns, dot Central Europe—partial lists can be found on the German wikipedia pages for Pestsäule and Mariensäule. These columns were often three sided to represent the Holy Trinity, dedicated to the Virgin Mary, and decorated with various saints. Wealthy citizens, fraternities, and even emperors commissioned and erected plague columns to thank God for ending a plague epidemic. During the Baroque period these columns became important symbols of Counter-Reformation Catholicism. 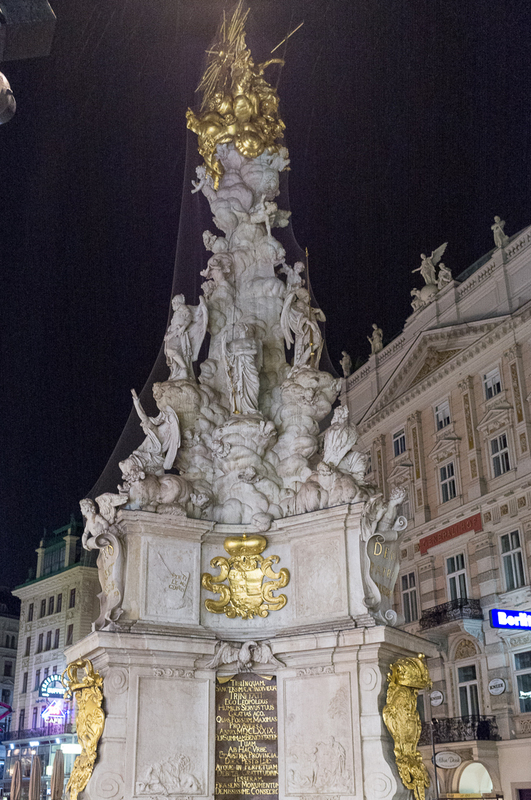 One of the more famous plague columns stands in the Graben in Vienna. In 1679 a major plague epidemic broke out in Vienna. By the time it ended, nearly 80,000 citizens had died. To celebrate the end of the epidemic, Emperor Leopold I commissioned a Pestsäule. After more than a decade, the column was finally inagurated in 1693 (if you can read German, skip the anemic English wikipedia page and read the German one). Two decades later, Emperor Charles VI commissioned Karlskirche to celebrate the end of yet another plague epidemic. 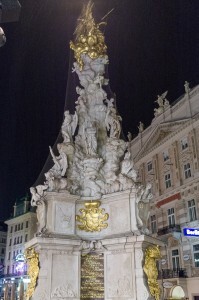 The plague column in the Graben in Vienna. In Košice, Slovakia, there is a smaller plague column toward the north end of the central square. It too celebrated the end of a plague epidemic, one that gripped the city in 1709-1710. Although smaller than its ornate cousin in Vienna, the plague column in Košice is nice example of Baroque Catholicism. These plague columns, particular those dedicated to the Virgin Mary, were key instruments of Counter Reformation authority. 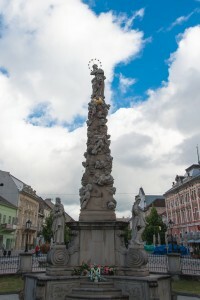 The plague column in the central square in Košice, Slovakia. But plague columns date back centuries. 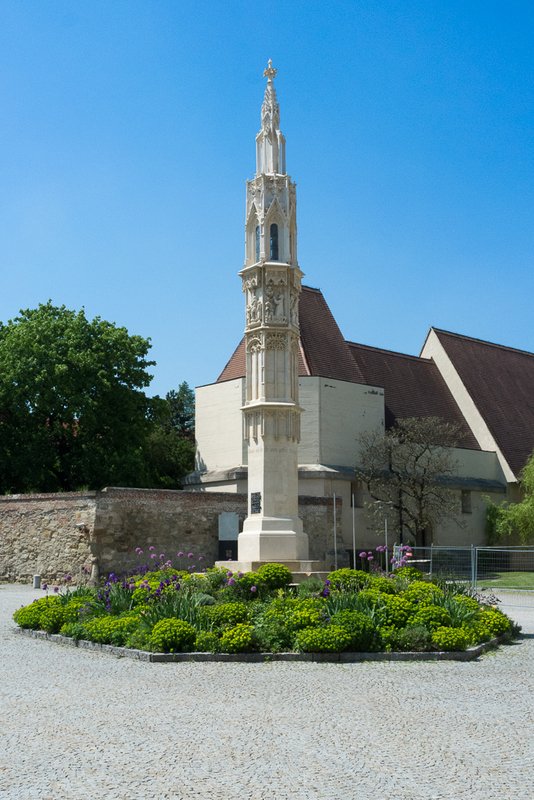 In the former cemetery in Klosterneuburg there is a Gothic plague column, often called the Tutz-Säule. The local citizen Michael Tutz dedicated this column in 1381 to celebrate the end of a recent plague epidemic. The Tutz-Säule in the former cemetery at Klosterneuburg monastery. These plague columns raise questions about the roles monuments play in shaping histories and our understanding of the past. At the same time, comparing contemporary columns highlights the visual and cultural tropes that were meaningful at the time. And comparing later columns with earlier ones helps us see how those tropes changed. The original observatory, the Maria Mitchell Observatory. Completed in 1865, this was the first building to be completed at Vassar. It is named after the famous 19th-century American astronomer Maria Mitchell, who was the first manager of the observatory. A bust of Maria Mitchell can be seen at the top of the stairs. Today the Maria Mitchell Observatory houses the Education Department. The newer observatory, the “Class of 1951 Observatory” was completed in the late 1990s. Two separate domes at the observatory house the main telescopes, a 32-inch and a 20-inch reflecting telescope. The two primary domes at the observatory. The BBC’s coverage of the Museum *of Soviet* Arcade Machines has been attracting considerable attention recently. The International Arcade Museum—which claims to be the world’s largest. The American Classic Arcade Museum. The Retro Arcade Museum … and baby boomer antiques. These museums often adopt grand rhetoric about education and enjoyment. 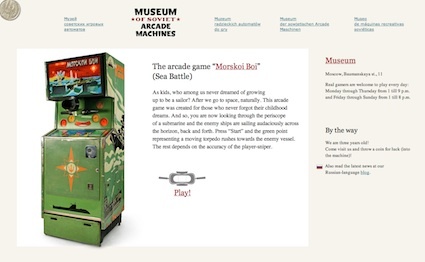 “A key goal of the IAM is to establish a definitive collection of mechanical amusement devices, coin-operated machines and videogames for the enjoyment and education of society as a whole.” The American Classic Arcade Museum promises to keep alive the history of coin-operated arcade games “through educational displays, cut-away models of games, vintage publications, antique catalogs and guest lectures given by prominent figures in arcade history.” These arcade and video game museums are clearly trying to pull the lowly video game with its “for amusement only” joystick out of the rubbish pile of societal detritus and to elevate the level of important cultural artifact. They all seem, however, to depend on nostalgia. As the Museum *of Soviet* Arcade Machines puts it: “There are moments when you want to come back in the childhood for a short while, because there were so many interesting things that we remember cordially till now.” Perhaps these museums are struggling because nostalgia simply isn’t a powerful enough reason.